Bold statement: Social media has added a layer of legitimacy to how we perceive and assess the actions of musicians (and notables, in general). 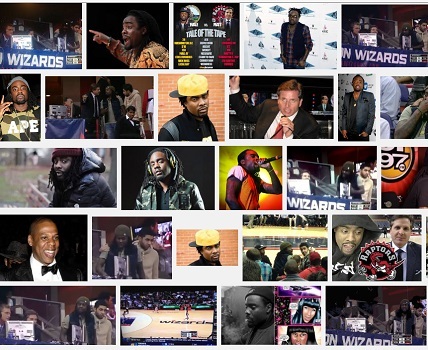 The five-minute feud between “well-known local rapper” Wale and the Toronto Raptors play-by-play team was excellent and properly rated. * 0:12 – “Supposedly, this fan is a well-known local rapper…”. Technically true. Cool button on Wale’s toque BTW!! * 0:28 – There is some serious disbelief that the “well-known local rapper” (WKLR) is actually well-known. Why? Is it THAT hard to belief? The immediate request for people to verify his celebrity by Twitter is kinda messed. * 0:32 – “He’s not Drake. That’s for sure!” is an early candidate for 2013’s whitest sounding diss. * 1:39-1:45 – “Wall-eh. Wall-eye. I caught a walleye once!”. Ugh, just stop. * 1:56 – Amazing reaction by Rautins at the assertion that Wale > Drake = “C’mooooonnnnn!”. Clearly, the Jeff Chang of NBA analysts was in the booth on this evening. * 2:21-2:23 – More Wall-eh/Walleye talk. These guys are dismissive. * 2:30-2:55 – I get a Raps-Wizards tilt in mid-February isn’t the most exciting gig but these two are wildly hung-up on the fact they’ve never heard of Wale. Check the game clock in the bottom right. This jag went on for close to a full quarter. * 2:56-3:08 – “What’s up? Sayin’ hey. There he is right… there”. Based on their expressions, it honestly doesn’t seem like Devlin and Rautins realize that this WKLR thought they were major a-holes. Also, Wale’s wingman looks like a poor man’s Drake. 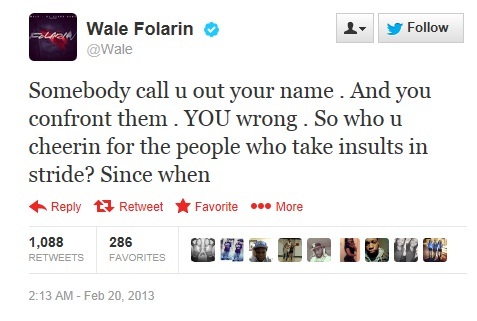 Wale went to Twitter after the game and posted this loopy defense of his actions. This was a great example of a non-event playing out like a non-event online without any interference from record labels or front office types or anybody except for those involved. 10 years ago, the music industry was so tightly wound that even a low-level news story like this would no doubt have gotten the hackles up of publicists and image consultants. Today, a lot of those filters are gone and artists can behave badly in public and everybody can see that the ultimate impact is nil or next-to-nil. Will Wale get anything but a small slice of publicity for basically telling these two to get bent? Will Devlin and Rautins be spoken to for coming down hard on a WKLR? Will hands be slapped? This story isn’t anything. And that’s why it’s something. In 2003, you’d be forced to follow this story through the lens of a writer or a PR team who no doubt would’ve spun it into something far more sensational. In 2013, you get the real time version and see that not much trends towards nothing. And that’s OK. In a somewhat similar vein, we’re in the midst of a Twitter “war” between Justin Bieber and Black Keys drummer Patrick Carney. The virtual fisticuffs have been fairly benign and it’s doubtful that anybody regards this as anything more than low-level crap. This “feud” will endure, fade into nothing and nobody will think that much of it after… or during. These are small distractions that (at most) should add a pinch of levity to being a music fan. Accordingly, we should allow our musicians to get a bit dangerous because ultimately, only the most extreme screw-ups are going to have a shelf life.